The promo gives an idea of what to expect next week. The new trailer hints towards the arrival of something/someone new at Winterfell. The Night King leading the army of the Dead, and riding on the undead Viserion is coming soon to attack it. In it, Daenerys is heard saying something about Kingslayer – Jamie Lannister. HEADS UP: The article contain spoilers for episode 1 (Winterfell) and possibly for episode 2 of GoT season 8. If you don’t want to spoil your watching experience, we recommend you not to follow further. If you don’t care, you can continue reading ahead. Proceed on your own will. Upon arrival, Jaime finds himself at Trial. In the teaser, it is clear that the dragon queen is talking about Jamie who had stabbed the Mad King, the father of Daenerys. 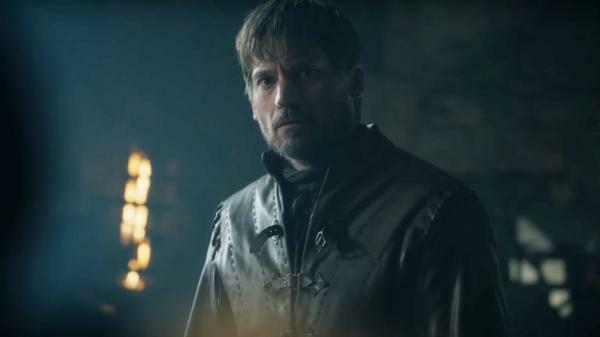 Jaime has reached Winterfell by the end of GoT S8E1. When he reached, Bran was waiting for him to arrive. Bran Stark refers himself as the Three-Eyed Raven, but there’s a little bit of Bran left in there, which would prove very juicy next week. Apart from it, we can clearly see Dany and Sansa mutually talking and tell each other that they shouldn’t have trusted Cersei in the first place. However, it has seemed to become like a trend in the 8th season. It looks like everyone has now come to know the Lannister queen’s treacherous ways. Usually, this happens when a character is going to conclude its storyline on the television series. After getting aware of his true being, nobody will fall for Cersei’s non-sense anymore. Someone may kill her, after taking care of the White Walkers. Tormund replies very little. And with this, the GoT 8×2 trailer closes with a hint of what episode 3 will bring. Grey Worm and Missandei share a kiss, maybe farewell kiss as we can see and hear Trebuchets loading up and firing, horses running scared, etc. Game of Thrones season 8 episode 2 will air on April 21, 2019, Sunday, in the US (HBO) and UK (Sky Atlantic). Indian fans can watch it online on Hotstar on April 22.